The phylum Rotifera contains about 2,500 described species and is thought to have originated in freshwaters. While the majority of rotifers are found in freshwater habitats, some genera have adapted to live in brackish or marine waters. A few species can also be found in the soil if it is adequately hydrated (Thorp 2001). Asplanchna, which are strong swimmers, are found in large, freshwater lakes. The name Rotifera refers to the corona of the animals that, when in motion, resembles rotating wheels. The corona is a ciliated organ located on the anterior end of all rotifers and is used for mobility and feeding. 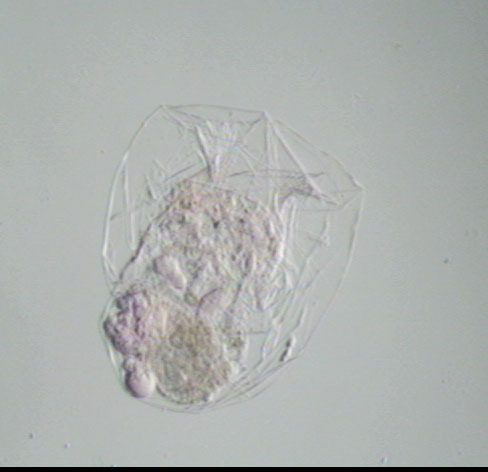 Asplanchna are soft bodied, sac-like rotifers that have incundate trophi (jaws), which are specific to the family Asplanchnidae, that they use to push food into their stomach, and then later pull remnant waste particles out of their stomach. They must use their trophi to extract large waste particles because Asplanchna lack a hind gut and have what is referred to as a blind stomach. In conjunction with using their trophi for excretion, they also have a protonephridial system composed of parallel tubules and flame cells that eliminate nitrogenous wastes from the body. Asplanchna are pseudocoelomates meaning their body cavity is not lined with mesodermal tissue, but instead is right next to muscular tissue. This enables Asplanchna to form outgrowths on their body by using muscle contractions and the pseudocoel to enlarge parts of their integument. This can be a defensive mechanism to discourage predators or larger Asplanchna from eating them. Asplanchna lack two distinctive features that are found in most rotifers: a hardened keratin integument called a lorica and a foot. Asplanchna have the unique ability to undergo dietary polymorphism which is a phenotypic change in body shape and structure based on diet and the presence of a-tocopherol (Thorp, 2001). 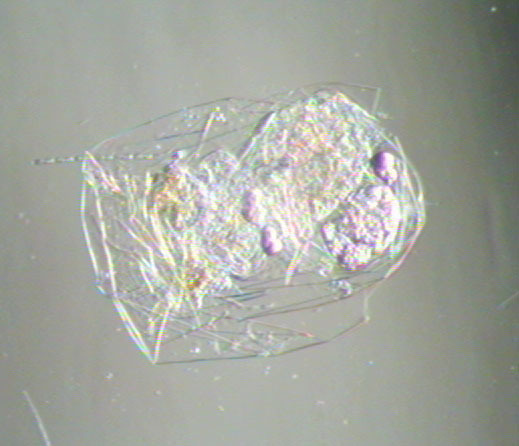 When saccate Asplanchna (which are the smallest morphotype of the species) ingest algae high in a-tocopherol, they produce cruciform offspring. The cruciforms are a morphotype that have lateral protrusions from their body walls that make them larger and more difficult to eat. The cruciform Asplanchna are able to produce another morphotype offspring called campanulates, which are the largest body type and typically are cannibalistic. It is thought that tocopherol signals to the rotifer that the waters are eutrophic which would cause larger prey. Asplanchna are predatory, but are also likely to feed on large algae. Their main diet consists of other rotifers, cladocerans, copepods, and ciliates (Sarma, 1998; Sarma, 2002). They have also been known to cannibalize smaller morphotypes. Asplanchna feed by randomly bumping into food particles that they process with chemotactic receptors on their corona do determine if they will ingest the organism or pass it up. If the Asplanchna decides to eat the organism, it will use its mastax to suction food in through the corona and then stuff the particles into its stomach with its trophi. Since Asplanchna lack a hindgut, it will use its trophi then to pull out any leftover particles like undigested carapaces. These rotifers ingest their food whole and because of this, size of food and the presence of spines or protrusions are limiting factors to how much and what Asplanchna eat. Feeding is also dependent on how hungry they are, the type of prey available, and the evasive tactics used by the prey. 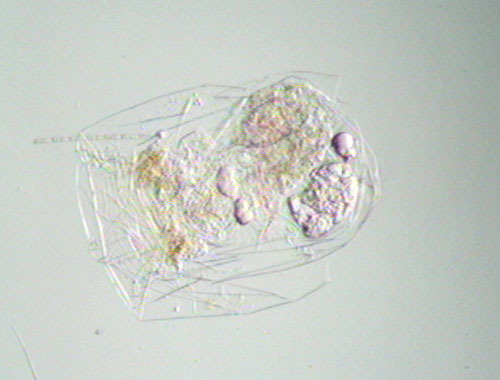 Although Asplanchna are predatory rotifers, they will also eat large algae. This one has consumed two Ceratium. Asplanchna display cyclical parthenogenesis which means they generally reproduce asexually but can have sexual reproduction under certain conditions. Females are usually amictic and produce diploid eggs. Males in this genus are rare, but can be found during very brief time periods triggered by environmental cues like temperature, crowding, food quality and quantity. The presence of a-tocopherol (vitamin E) in the diet of Asplanchna positively correlates with the presence of males in the populations and is known to control whether eggs develop as mictic or amictic organisms (Nogrady, 1993). Males develop from haploid eggs that are never fertilized in the female. Unlike most rotifers, Asplanchna are ovoviviporous and will keep their embryos inside until the eggs hatch and the live offspring are released into the water. Males, when present, are much smaller than females and will only live half as long as the females (2-5 days) because they do not eat (Nogrady, 1993). The growth of Asplanchna is directly related to the amount of food they consume. Sarma (1998) noted that when Asplanchna was fed a high density of two different rotifers, Anuraeopsis fissa and Brachionus calyciflorus, their growth rate was much faster than when they were fed lower densities. For a picture guide to identifying Asplanchna by species, click here. Brusca, R.C. and Brusca, G.J. 1990. Invertebrates. Sinauer Associates, Inc. Sunderland, Massachusettes, USA. pp. 431-435. Nogrady, Thomas. 1993. Rotifera. SPB Academic Publishing , The Hague, The Netherlands. pp 13-46. Sarma, S.S.S., Nandini, S., & Dumont, H.J., 1998. 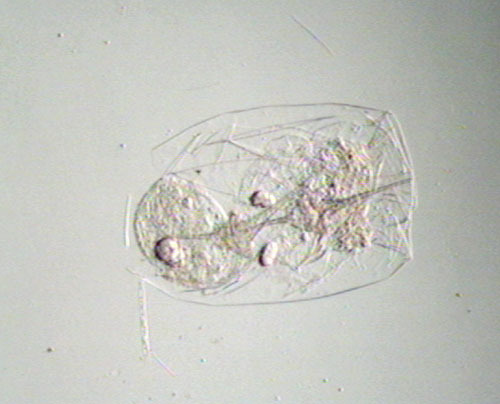 Feeding preference and population growth of Asplanchna brightwelli (Rotifera) offered two non-evasive prey rotifers. Hydrobiologia 361:77-87. Sarma, S.S.S., Larios-Jurado, P.S., & Nandini, S., 2002. Population growth of Asplanchna sieboldi fed two Brachionus spp. (Rotifera) raised on green ala and baker’s yeast. Hydrobiologia 467:63-69. Thorp, J. H. and Corich. A. P. 2001. Ecology and classification of North American freshwater invertebrates. Academic Press, Orlando, Florida. pp. 195-251.